On the Pere Marquette, up to two kids ages 2 – 12 can ride free with each adult rail fare purchased for Tuesday, Wednesday and Thursday travel between Grand Rapids, MI, and Chicago, IL. Valid for sale May 18 – August 30, 2016. Valid for travel May 31 – August 31, 2016. Valid for travel on Tuesday, Wednesday and Thursday only. Blackouts apply on all other days. Valid for up to two (2) free child rail fares for children ages 2 – 12 when accompanied by a paid regular (full) fare adult. Valid for travel on the Pere Marquette. 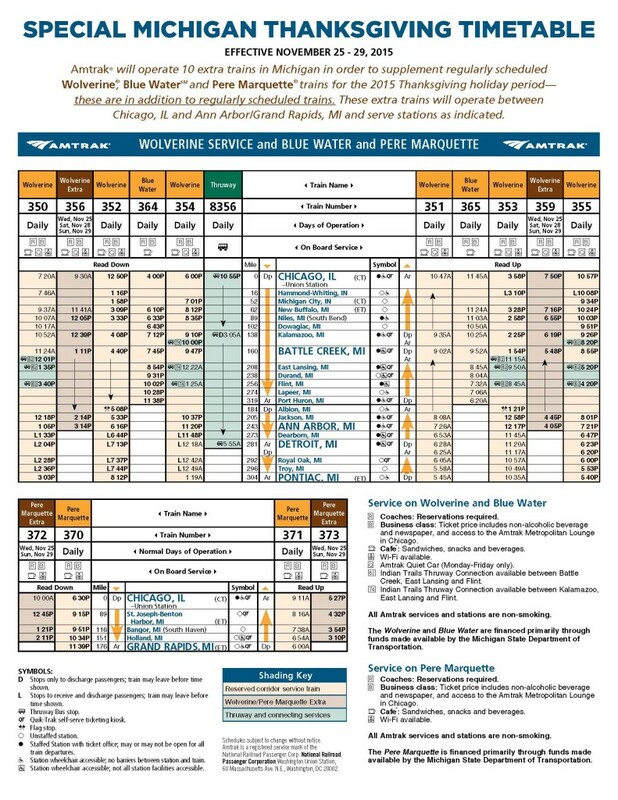 Fares, routes, and schedules are subject to change without notice. To receive discounts, apply Amtrak fare code V441 for Michigan trains. The fare code must be used to take advantage of these low fares. Tickets are non-refundable and some blackout dates apply. See the Deals tab on Amtrak.com for other applicable restrictions, including advance reservation and purchase requirements for discounts through March 31. Terms and conditions vary. A conductor talks to passengers aboard the Amtrak Blue Water. Amtrak will operate 10 extra trains in Michigan for the 2015 Thanksgiving holiday in addition to its regularly scheduled service. On Nov. 25 and 29, an extra eastbound morning train will depart Chicago bound for Grand Rapids and an extra westbound evening train will depart Grand Rapids bound for Chicago. On Nov. 25, 28 and 29, an extra eastbound morning train will depart Chicago bound for Ann Arbor and an extra westbound evening train will depart Ann Arbor for Chicago. Click on the timetable below for more details. Amtrak plans on utilizing every available piece of equipment to handle one of their busiest travel weeks of the year. Amtrak recommends that passengers book their trip early in order to best match desired travel times and days. Amtrak and RLE International (an engineering firm) worked with the Michigan Department of Transportation to develop an innovative system for getting people easily onto trains. People needing wheels for their mobility have been a special concern, given that many trains’ floors are several feet above the level of the platform at most stations around the USA. With this system, gentle slopes lead up to a platform at the same height as the floor of train coaches. To allow freight trains to pass the platform safely, however, it must be a couple of feet from the train. This system bridges the gap with a sliding platform that can be remotely controlled by Amtrak iPhones, or deployed manually. The first, experimental installation was built at the Ann Arbor, Michigan, Amtrak station. 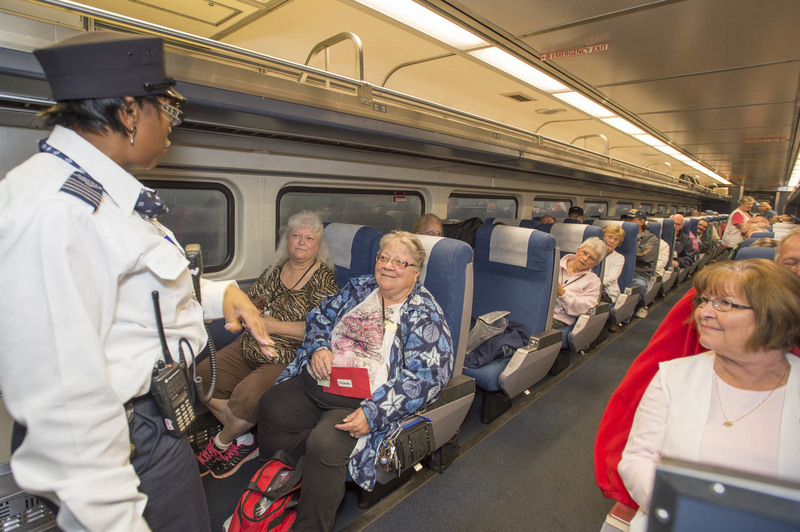 Dedicated on July 23, 2015 – the 25th anniversary of the Americans with Disabilities Act – the platform was not put into regular service until September 23, when it was used for train 353, Wolverine service Detroit/Pontiac to Chicago. The first full day of use, September 24, bagan with the station-stop shown in this video by train 351, also to Chicago. Priority boarding is now available at Chicago Union Station for an introductory price of $20, offering access to Amtrak trains ahead of general boarding. The Legacy Club is open daily from 9 a.m. until 9 p.m. Daily access passes are available for $20..
For more information, speak with a uniformed Amtrak employee at Chicago Union Station or stop by the Amtrak kiosk in the Great Hall. Sleeping car passengers, Business class and Amtrak Guest Rewards Plus and Select Executive members will continue to have complimentary access to the Metropolitan Lounge in the Concourse level of the station.